North East of Sheffield in Yorkshire, England. Click here for Map. 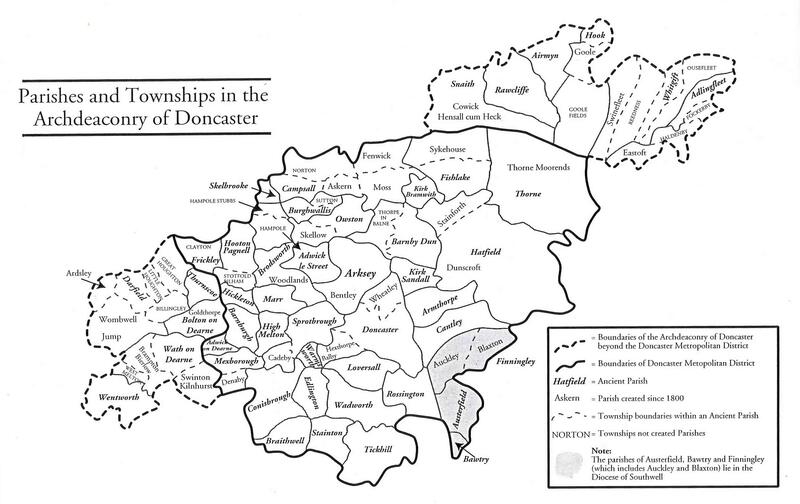 To see a 1914 Doncaster Archdeaconry Map of Parishes and Townships covered by Doncaster and District Family History Society, Click here (map displays in a new window). To provide a forum for members to meet and discuss the study of family history and genealogy. To arrange a programme of lectures, visits and other activities connected with subjects of interest to the Society. To seek out, transcribe, index and wherever possible publish or make available material relevant to the interests of the Society. To provide guidance in family history research and study to those living elsewhere whose families come from the area. Society’s Complaints Procedure Link to PDF file 35kb. Society’s Constitution 29 Feb 2012 Link to PDF file 22kb. Society’s Guidelines: Research for Others Link to PDF file 15kb. Society’s Protocols for Sharing Genealogical Research Link to PDF file 68kb. Are you interested in family history? Do you enjoy meeting people and helping others? Do you have skills you want to put to good use? If you can answer yes to one or more of the above questions, please get in touch with the Chair. Previous experience is not essential for many of the volunteering opportunities as training will be given. This year the Society completes its third decade. 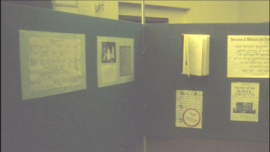 Support for its foundation came about in response to an exhibition in the Doncaster Central Library in 1979 celebrating “International Archives Year”. Tim Macquiban, the Doncaster Archivist had already made arrangements to entertain a visiting archivist from the continent as his contribution to this event. However, when I asked him if it would be possible to display some archives, relating to family history, he was very supportive as long as I made the necessary arrangements – a task I was pleased to undertake. Visitors to the week-long exhibition were offered leaflets spelling out opportunities to learn about family history. There were boxes for them to tick, not only to express an interest in joining a family history society but also to offer help in establishing such a society. A substantial number of people indicated their interest and a dozen or so offered to help. The latter were encouraged to come to our house to take matters further. We soon had a steering committee and a plan of action. This involved a publicity campaign in the local press and on local radio. On the day of inaugural meeting in January 1980 I was asked, at very short notice, to go to Leeds to record an interview for “Look North”. When this was transmitted, early that evening, our telephone rang continuously as enquirers sought more information. My wife and I were almost late for the launch in Doncaster Museum. A very large crowd turned up, far in excess of the number of chairs available in the meeting area. The Museum staff spent most of their evening ferrying chairs from other parts of the building. A draft constitution was approved, officers and committee were elected and details of the programme of events for the rest of the year were announced. Well over 100 people signed up for membership whilst they were there. Very few of those who joined had much knowledge of family history research so we arranged a series of house meetings. At these, members in a given neighbourhood came together, not only to share their experiences, but also to formulate detailed questions about specific topics, which could be featured in the Society’s ongoing lecture programme. In most instances, these house meetings were attended by one or two members who already had some useful research experience. Major initiatives during the first year included the establishment of the DONCASTER ANCESTOR magazine and two local projects, namely the transcription of the 1851 Census Returns and the recording of memorial inscriptions on gravestones in and around Doncaster. Some members were also involved in transcribing the local parish registers. In the eighties, very few of us were using computers although a few electric typewriters were being exploited on a regular basis. As membership continued to grow, the Society found it had access to members with special skills and knowledge. They revolutionised the Society’s project work by working closely with the local archivists and others to explore microfilming options thereby facilitating our indexing and publishing activities. The advent of home computers brought about a step change and it soon became possible to publish material on CD-ROM. By the late nineties the Society had a substantial collection of secondary material available for its members to use. A dedicated cabinet in the Library was no longer able to contain this expanding resource. There was a pressing need for suitable premises to combine storage of this important collection with the provision of a research room for members to consult its contents. In 2000 the Society rented some accommodation at Rossington but this was unsatisfactory because of the risk of vandalism so a more suitable alternative was negotiated at Bentley. However by October 2003 a more permanent facility was established at Balby, in a former school, conveniently adjacent to the Doncaster Archives. This was well-equipped with microform viewers and computers and by May 2005 online services were installed. 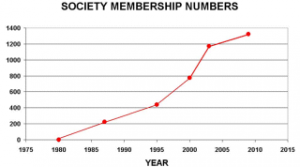 By the end of 2009, membership had reached 1324: growth had been very steady up to the mid-nineties but by then the spectacular accumulation of so much accessible secondary data, largely as a result of the Society’s project work, seems to have encouraged even more new members to join over the next ten years. 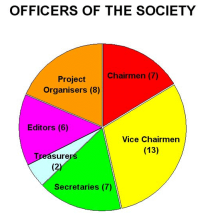 It is worth noting that, to date, the Society has published over 200 books and booklets and 40 or so CD-ROMs. Sales of these have contributed to its income and represented a not insignificant factor in maintaining an unchanged subscription level over the last 15 years. Over the years the Society has been very fortunate in attracting a dedicated and resourceful team of volunteers. Not only has it been possible to manage the expansion of facilities outlined above but in 1996 the Society was able to host a 3-day residential International Family History Conference at High Melton attracting 160 participants. Furthermore there has evolved a tradition of excellence inspired by a succession of responsible officers and loyal supporters. This has been much enhanced by close co-operation with local archivists and librarians from the outset. The present members of the Society now have a very rich legacy and so much to celebrate. We owe a great debt of gratitude to all of those who had both the foresight and the determination required to establish and develop this truly unique organisation. Long may it prosper.